Make Dough From What You Know - A Review of Crush It! Make Dough From What You Know – A Review of Crush It! Are you living, or just earning a living? 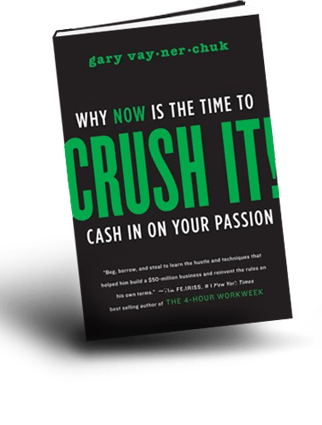 So asks wine critic, social media star and business consultant Gary Vaynerchuk in his new book, Crush It! (for more ideas from Gary, see this live interview on Twitter I conducted with him last week). The premise of Crush It! is that technology has disrupted the historical boundaries of business, making it possible for anyone with knowledge and passion to build a business that capitalizes on that expertise. Generally, he’s right. I’ve built a community and a business here on Convince & Convert by adhering to many of the principles in this book. However, I’ve started five companies previously, and prefer working for myself. Your results may vary. Certainly, like Trust Agents by Chris Brogan and Julien Smith (reviewed here), Crush It! is targeted at entrepreneurs and would-be solo acts that are itching to strike out on their own, and need the nudge to do so. This is not a book for corporate marketers. The success path painted by Vaynerchuk is paved with content. Audio, video, written. It doesn’t matter, so long as you make a lot of it. And that really strikes at the core of the Gary Vee vision, which is that the future of business is in hyper-targeting. Finding the cracks and crevices and building content-driven enterprises that can fill the needs of those small but passionate audiences. In many ways, this notion dovetails with Chris Anderson’s The Long Tail. To some degree, however, this advice is self-limiting. Most often, hyper-targeted niches can be capitalized upon, but by definition the size of that opportunity is narrow. That doesn’t mean it isn’t viable, and to his credit Gary frequently balances millionaire dreams with “make a living” reality in the book. Expertise combined with differentiation. Although he doesn’t describe it that way, that’s the Vaynerchuk content success equation. I certainly agree with the differentiation component. It’s one of the things I struggle with here. How do I stand apart from the other social media consultants? It’s important, and the book provides a few interesting examples. The expertise side, however, is trickier. The book presumes that anyone can Crush It! Of course, anyone can start a blog, and market it well. But, do they have the expertise to transform a category? To me, it seems like you need to have a very solid knowledge base before heading down this road. Perfect for prosumers. For others without existing expertise, it will be tough to break through. There are many parallels between Crush It! and Tim Ferriss’ 4-Hour Workweek book. Similar size, approach, and subject matter, especially the concept of monetizing your passion. Ferriss even blurbs the cover of Crush It!. I find it extremely interesting that Vaynerchuk unabashedly describes the extremely long hours required to successfully implement his methods, at one point encouraging parents to work from 9pm to 3am daily. Alternatively, Ferriss’ premise is to work less, not more, using automated business and shortcuts to save time and enjoy life. Although a bit repetitive at times, and not particularly detailed, Crush It! is a motivating, entertaining book that I believe you’ll find yourself returning to over and over for a shot in the arm. Everyone self-employed, or desiring to be self-employed, should pick up a copy of the book. It reads like a 90-minute conversation with Gary, and that’s time well-spent.